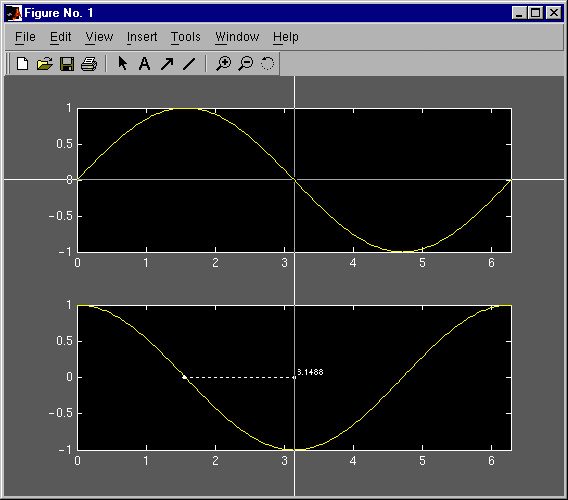 The software provided on this page has been tested with Matlab version 5, and 6 on HP-UX, Solaris, Linux, and Windows (MinGW) and Matlab version 7 on Windows. A history of my Matlab Central File Exchange submissions can be found here. MTk is a high-level command line interface for creating graphical user interfaces using Handle Graphics. MTk is for people who don’t need a guide to write graphical user interfaces. Below is the code of MTk’s Tab Panel demo. As you can see, only three commands are needed to build a whole GUI. Here is the result. Isn’t that nice. The getopt command parses options from an argument list. The aim is to be close to GNU long options functionality, and beyond. Here is an example, for how to use getopt. % Parse options from argument list. Select a figure or axes region. This rubber-band command has a lot of customization options, for example, rubber-band mode (box, x, y, line), optional display of cursor coordinates, free selection of color, line style, marker symbol, and figure cursor, axes expansion, choice of return values (points, vectors, rectangle), and the type of rendering for animated objects. The rubberband command depends on the getopt command (see above). Here is an example for how to it. Convert text file for printing. The textpr command converts a text file for printing. Paper size, page layout, n-up printing, basic formatting, and output file format can be customized via command line options. The textpr command depends on the getopt command (see above) and a Ghostscript executable (like the one shipped with older versions of Matlab). The m-config package provides GNU Autoconf macros checking for Matlab features and platform incompatibilities. Documentation and a complete example project are included in the package. See the Matlab Configuration Utilities manual, for more details. m-config is free software and distributed under the GNU General Public License. The m-dirs package provides the directory stack commands as known from various Unix shells for Matlab. Available Matlab commands are dirs, pushd, and popd. m-dirs is free software and distributed under the GNU General Public License.